With an updated graphic for 2019, The Atris Birdie is back better than ever! 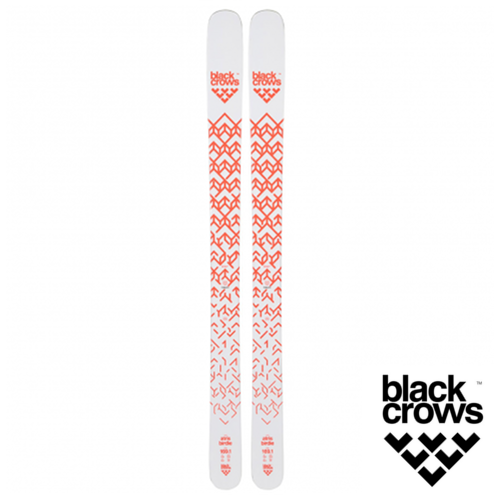 One of our favorite all time freeride skis. Some rockered powder skis can leave you feeling like your not stood on very much at all, lacking stiffness and stability particularly if things are getting chopped up or if you're skiing fast, not the Atris Birdie. From the second you start sliding you know you are stood on something special. Featuring a double rocker and 108mm underfoot, the Atris Birdie give superb float and control in powder with easy turn initiation and tips you can't sink. They have that 'ski anywhere feeling', easily holding a line when you're charging and the smooth, stiff flex makes them feel like your stood on a coiled spring or a trampoline, helping you absorb big hits whether you're expecting them or not! All this whilst still able to make tight turns and open, sweeping lines with ease, whatever speed you're skiing. The Atris Birdie is not just a powder day only ski though, this ski's Chamonix genetics really show when conditions are mixed. They can blast through crud, carve lines on the piste like a ski half its width and give superb edge hold on icy hard pack making this a great choice for a 'one ski' for around the resort.